Discover the best of Latvia’s eco-cosmetics at the new and curiously named Dievs. Daba. Darbs. store located in the Domina Shopping Centre. Even though Latvia’s name has hardly been shining in the sky of world cosmetic brands, the trend is ever growing – more and more cosmetics are being created, especially focusing on eco cleanliness. 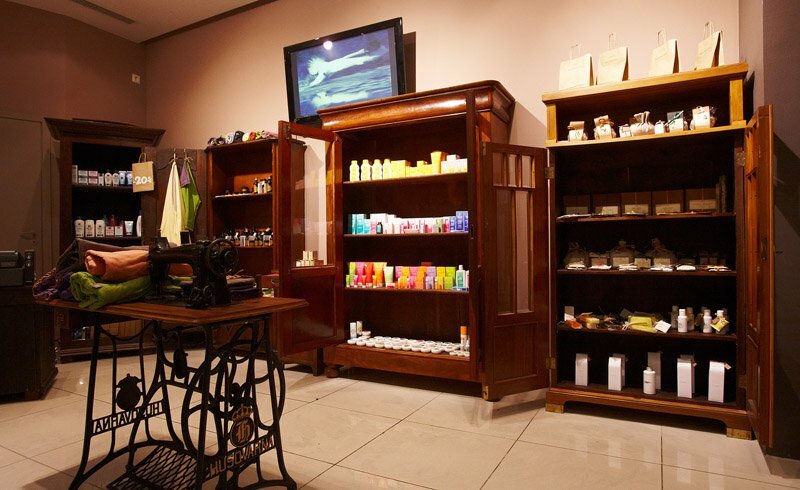 This little store is overflowing with aromatic mixtures for the body, eyes and hair. There are cold pressed oils, handmade creams and even a shower gel made on the base of whey. To be in full harmony, however, it’s not only the façade of your body that should be shining, but the inside as well. So the shop offers healthy herbal teas gathered from Latvia’s rich countryside and food supplements made only from natural ingredients. And those who are interested in a nature-friendly atmosphere at home will be delighted with the assortment of household cleaning products. Check out the creative bedroom items from the local brand INCH 1967 and artistic children’s clothing creations by Dana Podkalne. The owner of the store, Linda Rozenberga, told RigaNOW! that in future the shop is planning to make its own cosmetic line and is currently gathering experience and working on formulas. Till then, visit the store to take home with you greetings from Latvia’s meadows and wood.